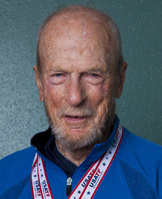 On July 31, 2011, at age 92, John Boots earned number one rankings for both the 800 and 1500 meter runs at the USA Masters Track & Field Championships in Berea, Ohio. A determined competitor at national and international running championships, John has been breaking records and earning medals since he first started running competitively in 1982. That’s right…John didn’t even enter his first foot race until he was 63. Surprisingly, John made the decision to take up running after a health checkup revealed multiple problems with his heart. Simply unwilling to accept the diagnosis as a mandate to relax and slow down, John sought to actively strengthen his cardiovascular capacity. Daily walks led to jogs and it wasn’t long before his daily routine became 5-mile runs. Fiercely driven and focused on results, John consistently set a new goal to replace each one he surpassed. John was soon competing in races around the world and earned an impressive collection of medals and awards before running-related injuries began to take a toll on his joints in his early 80s. Conventional wisdom dictates that John would come to his senses, pack up his running shoes and start to act his age. But life experience has taught John that age does not limit; it enables. So he came to his senses…and adopted an entirely new way of running (the Pose Method) that protected his joints. Despite the challenge of “relearning” a routine activity, John’s incredible discipline and determination have resulted in faster times and new records at age 92. We learned about folks like John Boots in school, individuals who never surrendered to defeat and courageously found ways to overcome any obstacle. John’s success shows us that the only limits we face in life are those we choose to accept. John Boots… Peoples Health Champion.